POTSDAM, N.Y. - The Merrimack College men's ice hockey team scored late but couldn't complete the rally, as No. 15 St. Lawrence defeated the Warriors, 4-1, on Saturday night at Appleton Arena to conclude a two-game weekend set in North Country. Location: Appleton Arena | Canton, N.Y.
- In a penalty-filled first period, neither side would find the back of the net despite combining for 23 shots on goal. Merrimack had two early power plays before St. Lawrence did likewise. Later in the frame, a five-minute major levied against a Saints skater gave the Warriors another extended man advantage, but the period came to an end with no score on the ledger. - The Saints grabbed the lead off an early second-period strike from Gavin Bayreuther at 3:28, and the score went unchanged the rest of the way through a much quicker-moving period that didn't see a penalty called until the 18:14 mark. - The ice appeared tilted in St. Lawrence's favor through the first half of the second stanza, as the hosts were outshooting Merrimack by an 8-1 margin at one point, but the Warriors did eventually settle things down and finished with nine shots on net in the period. - St. Lawrence picked up key insurance goals early and midway through the frame, as Michael Laidley's second of the year came at the 2:15 mark before Michael Ederer's first marker was scored at 10:33 to propel the Saints to a 3-0 advantage. 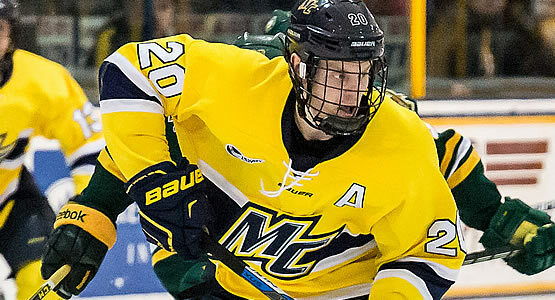 - Senior Hampus Gustafsson (Ljungby, Sweden) scored Merrimack's first goal in six periods by tipping in a shot while the Warriors skated on their sixth power play of the night, but St. Lawrence's Ben Finkelstein answered just over three minutes later to settle for the final margin. SLU #1 (Bayreuther/Finkelstein/Marnell) | P2 3:28 - Puck picked up at the left wing half wall, curled behind the back of the net and scored off a wrist shot from the bottom of the far circle. SLU #2 (Laidley/Sullivan) | P3 2:15 (PP) - Goal off a rebound from a shot in tight on the power play. SLU #3 (Ederer/Harrison/Dahl) | P3 10:33 - Skated out of the near corner, wrist shot from the near circle that sneaks in over the shoulder. MC #1 (Gustafsson/Kovacevic/Kolquist) | P3 14:30 (PP) - Tipped in front off a shot from the point. SLU #4 (Finkelstein/Bayreuther/Marnell) | P3 17:38 - Puck carried across to the bottom of the near circle, tough-angle wrist shot sneaks in over the shoulder. Merrimack returns home to continue a month-long clash with ECAC teams, as the Warriors welcome Colgate University to Lawler Rink for a two-game set on Homecoming Weekend starting Friday, Oct. 21. Puck drop is set for 7 p.m. on both nights.